Their letters were created by Brahma and have been passed down from their beginnings until now, being forty-seven in number. They combine to form words according to the object [declension?] and shift in use according to the action [inflection?]. It has spread around and branched off, its source being deep and broad. Due to regions and peoples there have been some changes, though the words are generally not different from the original source. Central India is especially proper, their diction being elegant and the same sound as devas with a character sharp and clear, which is a model for people. The neighboring countries have become accustomed to erroneous pronunciation. In their chaotic ways and base nature they do not maintain genuineness. Such a stated belief on Xuanzang's part however did not encourage many Chinese clerics and scribes to learn Sanskrit in China. While indeed in the time of Xuanzang it was possible to learn Sanskrit to some degree in China, this was not so widespread or alluring it seems throughout the Tang dynasty (618-907) when many texts containing mantras and dhāraṇīs were translated into Chinese from Sanskrit. Although the language might have been divine in Indian Buddhist minds, this did not merit precise use of it on the part of Chinese Buddhist clerics. Sanskrit and Chinese are fundamentally very different languages. Unlike the former, the latter lacks gender, declension, conjugation and any number of other features common to most Indo-European languages. This was as much the case fifteen centuries ago as it is now. Unlike the Tibetans, the Chinese never attempted to produce a standardized phonetic script to preserve Sanskrit pronunciation. 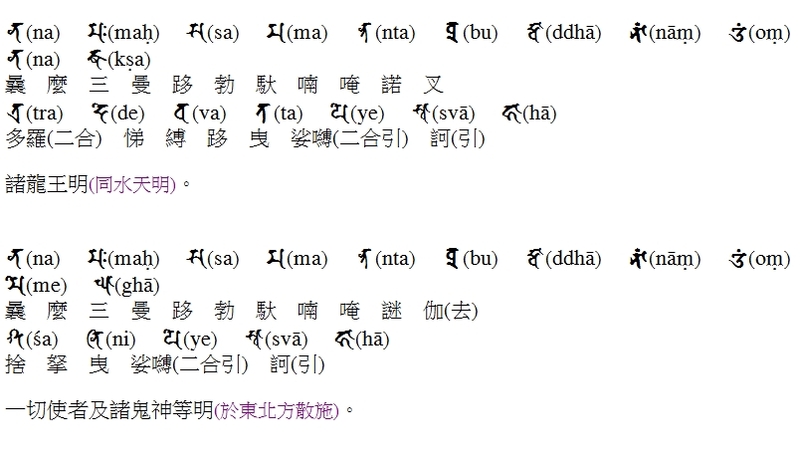 While indeed some texts employed Indian siddhaṃ script for preserving the proper pronunciation of Sanskrit mantras, the general preference in both ancient and modern times has been to use Chinese characters (hanzi 漢字) for their phonetic values in transcribing mantras and dhāraṇīs. Go 吳 – Readings from before the 7th / 8th centuries. Possibly from the Korean peninsula or southern China. Often used in Buddhist texts. Kan 漢 – Readings from the mid Tang Dynasty (618-907). Generally reflect the pronunciation of Chang'an 長安. Tō 唐 – Readings from the Song Dynasty (960-1279). Often used in the Zen school. Here tō 唐 refers to China rather than the Tang Dynasty. This is why a single Chinese loanword in Japan can have multiple pronunciations. For instance, 和尚 (preceptor or priest) is pronounced oshō in Zen, kashō in Tendai, and washō in Shingon. In modern Mandarin in would be héshàng. The pronunciation of Chinese loanwords in Japanese is actually closer to Middle Chinese than modern Mandarin (this is not necessarily the case with other Chinese dialects however). For example, the character 食 (“to eat”) is pronounced shoku in Japanese and shí in Mandarin. The consonant ending from earlier Chinese has been preserved in the Japanese importation of Chinese. The Japanese language was thus better able to retain approximate pronunciations of Sanskrit mantras and dhāraṇīs. They also continued regularly using the phonetic siddhaṃ script, though not without problems. It is clear that the Japanese pronunciation, which has attempted to preserve Middle Chinese pronunciation, better reflects the Sanskrit. This is why in my attempts to reconstruct certain mantras' pronunciations from Classical Chinese texts I have to consider the Sino-Japanese readings of characters. The modern Mandarin is just too far divorced from Middle Chinese, which was the form of Chinese used when the mantras in question were transliterated. However, not all mantras will have the siddhaṃ in the primary text. In the absence of it, one has to attempt to reconstruct the Sanskrit using a variety of means. Bear in mind the pronunciation of a mantra can differ also according to the lineage (in Japanese: ryū 流), so traditions will have their own inherited pronunciations. Here kheduma / induja would be read in Sino-Japanese (again remember this is reflecting Middle Chinese pronunciation) as keidoma 契弩摩. I would assume this reflects either a mistransliteration of heard Sanskrit, or the speaker was in fact speaking an Indian dialect rather than standard Sanskrit (or it was not their native language and they mispronounced the word). In any case, it simply seems logical to read induja (“son of the moon”) here and not kheduma. It should be clear then that East Asia – neither China nor Japan – did not attempt to preserve precise transliterations of mantras and dhāraṇīs. This is understandable given that intensive Sanskrit studies with complete grammars were seldom undertaken or available. This stands in contrast to SE Asia where the study of Pāḷi was diligently undertaken and preserved until the present day. In the absence of any siddhaṃ for a mantra in transliterated Chinese, the scholar is left to start a long process of guesswork. In some cases, there are parts of the mantra which are identical to other parts of known mantras. However, this will not always be the case as I've discovered. As noted above, this is one of the most challenging aspects of translating Classical Chinese Buddhist texts. There are fortunately some scholarly volumes available today which provide decoded mantras, though again these have to be approached with caution. Nevertheless, as a translator when I have to translate these mantras I do appreciate seeing what others have produced. I am neither a Sanskritist nor Vajrayāna specialist, so I would hopefully have experts to defer to, though in many cases I am left to figure things out alone. I can make out parts of it, but not the whole thing. The opening part is very similar to the Heart Sutra dhāraṇī. Lin Guangming 林光明, ed. Xinbian Dazang quan zhou 新編大藏全咒. The New Edition of All Mantras in Mahāpiṭaka. Mahāpiṭaka-mantramāla-purṇāṅga-nava-saṃskaraṇaṃ. 18 vols. Taipei: Jiafeng chubanshe/Mantra Publisher, 2001. It doesn't seem like your dhāraṇī in question has been dealt with in the online world yet unfortunately. I can definitely discern parts of it as well, but a lot of it is unclear to me. One other problem is that earlier periods used different forms of transliteration, like this one. In the Tang it was more standardized to some extent, or at the very least you had a single translator and his students doing many texts, such as Amoghavajra, so there was consistency. Also, during the Tang a lot of texts were translated in Chang'an, so there was perhaps a common understanding of how to transliterate Sanskrit with Chinese characters. There were manuals on Sanskrit pronunciation and transliteration entirely in Chinese. That being said, they really never attempted to faithfully preserve the pronunciation of anything. Nowadays in Chinese temples they still insist on reciting everything using modern Mandarin readings of these transliterations, so it ends up being garbled gibberish. Almost nobody you ask will know what they mean, but they'll memorize long pages of them (and it is mandatory that you do so as well in some Chinese Buddhist seminary programs). I'm surprised to see you saying that "they really never attempted to faithfully preserve the pronunciation of anything." because I would have thought that was exactly what the elaborate transliterations were about. Also the continued use of Siddham would seem to argue against lack of concern for correct pronunciation. My impression of Kūkai (though it's been a while since I looked at his stuff) was that he highly valued correct pronunciation of mantras. And this is why Siddham is still part of the Shingon curriculum. Or was it more like getting a good enough approximation - like Roman script without diacritics? The transliteration into Chinese was only loosely approximate, and I would assume in the Tang the Chinese and Indians were both well aware of this. Nevertheless, although siddham was an option, I often have gotten the impression East Asians just preferred to transliterate things into Chinese. One reason I say this is that Kūkai's journal, which I viewed at a museum in Japan some time ago, reveals him transliterating Sanskrit words into Chinese. He does this in his Chinese works (not all though) as well, rather than using siddham. Also, the extant texts available in modern canons show that only a portion have siddham. The general preference has been to use Chinese exclusively. Also, bear in mind that Japanese use of siddham is not without its problems. For one thing, they use Japanese phonetics (basically katakana readings) of mantras, and from my understanding these vary from tradition to tradition. Also, the texts I've seen with siddham often display constant errors, like bajra for vajra or vudha for budha. This might have been later scribal errors, but then that just goes to show how precision was not a priority. In China it was much the same. Siddham was paired with Chinese characters for approximate pronunciation. So, there were scribal problems plus the pronunciation was only kept approximate in Japan. Some scholars also have reservations about Kūkai's abilities in Sanskrit. He might have read siddham and knew a lot of vocabulary, but that doesn't mean he knew Sanskrit. Classical Japanese readings of siddham would have been like their katakana pronunciation of English words. Chocolate cake becomes chokoreeto keeki, for instance. It works sort of, but it isn't precise. Would it be worthwhile to get the pronunciation in Cantonese, Hakka, etc.? For me, it would drive me nuts. The romanization of Chinese will normally be in Mandarin as they recite things in Taiwan generally in Mandarin, not Taiwanese or Hokka. Likewise Cantonese romanization wouldn't be widely available. As far as mantras are concerned, I'd say find the romanized Sanskrit and learn what they mean. Reciting them as Chinese is meaningless. Thanks so much for this fascinating post! I'm wondering what the function of the 1-3 character phrases or notations are in parenthesis - for example,the (二合) notation in the mantra you transcribed: 唵(引)母駄曩乞殺(二合)怛羅(二合)娑嚩(二合)弭曩(名位)契弩摩娑嚩(二合引)賀. Also - I've always wanted to ask someone why, in East Asian Buddhist ritual manuals, mudra descriptions refer to the two hands of the deity or practitioner with the phrase 二羽? It's a strange euphemism, or perhaps I'm just missing something. Thanks so much for any information you can provide! 引 indicates a long vowel. 二合 is a phonetic combination of the last two characters. [L=113062] a symbol. N. of the number two Var. Hcat. [p= 573,3] [L=113067] the side or wing of a building AV. [L=113068] the wing or flank of an army MBh. Hariv. [L=113073] side i.e. position , place , stead (°kṣe ifc. instead of or by way of) ib. [L=113075] one of two cases or one side of an argument , an alternative (°kṣe , " on the other hand " , with atra , " in this case " , pakṣā*ntare , " in the other case ") Pa1n2. Sch. [L=113077] an action or lawsuit Ya1jn5. Sch. [L=113078] (in logic) the proposition to be proved in a syllogism Tarkas. Bha1sha1p. [L=113081] N. of sev. men VP. [L=113083] the wall of a house or any wall L.
[L=113086] contradiction , rejoinder L.
[L=113087] the ash-pit of a fire-place L.
[L=113088] a royal elephant L.
[L=113089] a limb or member of the body L.
[L=113090] the feathers of the tail of a peacock , a tail L.
[L=113091] proximity , neighbourhood L.
[L=113093] purity , perfection L.
Thank you very much for this. I was unaware this had been done before. I'll have to compare their reconstructions with what I managed to do. I generally look at the Japanese preserved readings, but I suppose the Vietnamese are equally worth examining! There are two options: Âm Hán Việt and Pinyin. The former is Sino-Vietnamese.